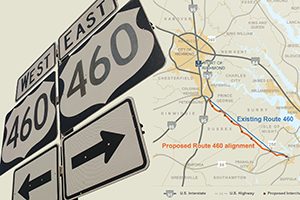 January may bring the next turn in the road for Virginia’s much maligned U.S. 460 highway improvement project. That’s when the U.S. Army Corps of Engineers is expected to weigh in with a recommendation on which of five possible alternatives — including a no-build option — would be best in terms of the least environmental impact on a massive 55-mile highway project stretching from Suffolk to Petersburg. The month also will see a push for legislative reforms in the state’s Public Private Transportation Act (PPTA). The 460 project, which began as a P3 (an acronym for public-private projects) already has cost the state $300 million, and there’s no paving to show for it. The new four-lane divided toll road would run parallel to the existing Route 460. The project was a top transportation priority of former Gov. Bob McDonnell. He and his transportation secretary, Sean Connaughton, aggressively pushed the project on the grounds that it would boost economic development, relieve truck congestion coming from the Port of Virginia and improve the region’s capability for hurricane evacuation. Yet, the state didn’t obtain required federal environmental permits before work began on a route that, under its current alignment, would destroy hundreds of acres of wetlands. By that, Jones means that Virginia’s transportation secretary would be required to sign off on any PPTA deal. “Before any deal can be finalized, the secretary would sign off so the terms of the agreement are what was initially contemplated and in the public’s best interest,” he explains. Some legislators, including Jones, were angered when the McDonnell administration signed a contract with a consortium to build the new U.S. 460 back in December 2012 — a month before the assembly reconvened. “It was signed, done and delivered, and now we’re sitting here holding the bag,” says Jones. Layne notes that the 460 project, which started out as a PPTA, later morphed into a traditional design-build project with no notice to the public or a new procurement. “It’s blurry as to who was told to do what in 460,” he says. That’s why Jones thinks a change in the state’s vaunted PPTA law, long considered a model for the county, is warranted. Codifying the changes into law means tougher requirements will stay in place regardless of who’s in office, says Jones. The Commonwealth Transportation Board (CTB), which authorizes money for state transportation projects, also approved reforms in November giving the board more power to assess the risks of proposed public-private partnerships. The board, appointed by the governor, will be briefed in full on the business terms of a road-building contract before it votes. “Not like in 460 where there was just a general overview,” says Layne. To involve legislators early in the vetting process, the reforms put the chairman of the House and Senate Transportation Committees on PPTA steering committees that would review P3 projects independently. The Southern Environmental Law Center (SELC) advocates taking this approach one step farther, by requiring these chairmen and the chairmen of the assembly’s money committees to approve a project prior to the signing of a comprehensive agreement. Despite such reforms, the 460 project remains a tangled mess. Layne expects the Army Corps of Engineers and the Federal Highway Administration to release its recommendation on what would be the “least environmentally damaging practical alternative” by late January. Then the CTB will make a decision on the future of the road. “Once we know what is permitted, then we’ll know how to negotiate with the existing contractor and what we have to do with the bonds,” Layne says. A nonstock, nonprofit corporation created by the state, of which Layne served as chairman, sold about $243 million in tax-exempt bonds to help finance the U.S. 460 Corridor Improvement Project. Bonds were sold on the assumption that the highway would be a toll road. If the permitted route does not include tolls, this could invalidate the state’s warranty with bondholders. “We may have to reimburse the tolls, the bond process that we’ve used. Plus there may be negotiations with the current contractor if we don’t use them going forward … That’s why it could cost as much as $500 million … We could be out of pocket additional millions if we decided there’s nothing to be done here, and we just need to settle up. That’s a low probability, but I want to disclose it,” says Layne. Of the five alternative routes being considered by the Corps for a new U.S. 460, three involve tolls. More than 500 people turned out in the fall for three public hearings on the project as the Corps gathered data for a draft supplemental environmental impact statement. Released in September, the draft showed that the original approved route backed by McDonnell’s administration would damage 613 acres of wetlands — nearly five times an original estimate of 129 acres, and it put the price tag at $1.8 billion, instead of an earlier estimate of $1.4 billion. The least expensive alternative calls for improving the existing 460 at a cost of $974 million, which would affect 91 acres of wetlands. The SELC favors a hybrid approach of making some traffic safety improvements to the existing 460, and then going with a no-build option. The significance of the new draft environmental impact statement is that it “does show the staggering magnitude of the potential wetlands loss, as well as streams impacts, and they have jumped considerably since the initial studies … That’s why we have believed for years — and the evidence just gets stronger — that the environmental impacts far outweigh the limited potential benefits,” says Trip Pollard, a senior attorney with the SELC. In addition to wetlands, the SELC notes that thousands of acres of forests, wildlife habitats and farmland in the project area would be affected by the originally approved route. The SELC also contends that the potential benefit of facilitating freight movement from the port would be limited by the institution of tolls. According to the draft statement, truck traffic currently accounts for 16 percent of all daily traffic on 460, and overall truck percentages are higher than national averages for rural roads with similar classifications. Yet improving the original 460 would displace the highest number of businesses. “If you were to improve the existing 460 the entire length, you would have some design challenges and interruption of businesses and some negative impact on the character of the community,” says Jones.